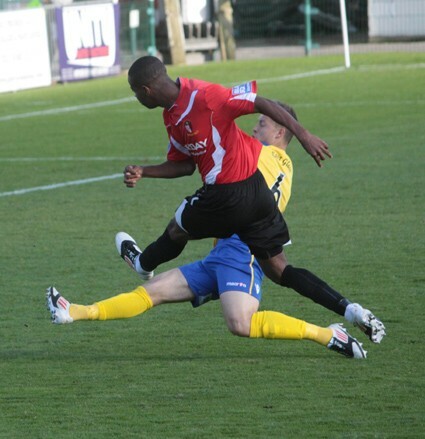 Hayes & Yeading deservedly moved into the final qualifying round of this season's FA Cup with Budweiser although it took a gem of a free-kick in stoppage time from Luke Williams to see off the challenge of high flying Salisbury City at Kingfield on Saturday afternoon. Both manager's stuck with their starting XI's that earned 4-0 Blue Square Bet South victories in midweek and it was the home side who had the first strike at goal as Daniel Wishart set up Jerome Anderson who saw his shot take a deflection off Whites skipper Callum Hart forcing a diving catch from Will Puddy. Just three minutes later the ball was in the net, sadly for United it was theirs. Theo Lewis had the ball just inside the area on the left as Calum Butcher dived in and brought him to the ground leaving referee Mr Cook with no option but to point to the spot. 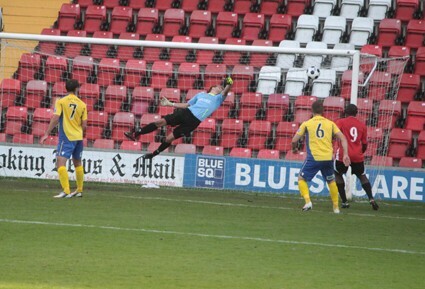 Chris McPhee stepped up and smashed the penalty straight down the middle giving Beasant no chance. On fifteen minutes it could have got worse for United who seemed to be off the pace early on which is surprising for a Nas Bashir side. 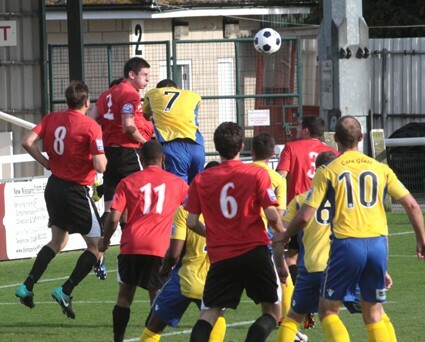 McPhee threaded the ball through to Jamie White, his shot from 10 yards being well blocked by Beasant's boot as the United keeper spread himself to block, Pelé completing the clearance. Luke Williams just failed to find the far corner with a free-kick from an acute angle on the left while another free-kick, but at the other end saw Ryan Brett pick out Robbie Matthews but his header was well over the top. Free-kick's seemed to be the main creator at this stage, McPhee's kick into the United area being part cleared as far as Theo Lewis who fired wide from the edge of the box. Luke Williams saw an effort swallowed comfortably be Puddy and then with just a couple of minutes to go to the break the equaliser finally arrived. Anderson fizzed a low cross through the Whites area with Ugo Udoji putting the ball out for a corner as Wishart arrived at the far post. Luke Williams played the corner short to Wishart, his centre being met by Butcher who glanced a header beyond the reach of Puddy into the far corner of the Whites goal (pictured below). Stoppage time saw United almost come unstuck as a Butcher clearance fell nicely to McPhee, Cadmore doing well to stick out a boot and deflect his effort wide of the upright and it was all level at the break. Beasant was the first keeper to be called into action after the break, pushing an angled White drive around the post after good approach play from Matt Clark and Lewis. United then started to take some control on proceedings, Wishart broke away from the attentions of no fewer than four Whites players and slid the ball neatly in to Anderson who screwed his effort wide. Cadmore then fired a free-kick from defence perfectly into the path of Luke Williams who cut inside and tried his luck from 20 yards but his shot went wide of the far post. The final ten minutes arrived and it was to really be one way traffic as the visitors seemed content to settle for a replay at the RayMac. Dan Spence sent Wishart away on the left side, his cross finding an arriving Mark Bentley at the far post but with the ball marginally behind him, the United midfielder could not reach far enough back and his header went wide of the target. 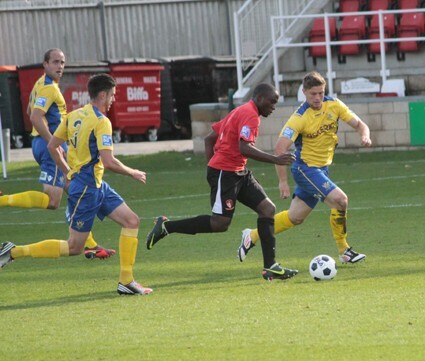 The ball was quickly back with United as substitutes Tobi Joseph and Manny Williams caused problems for the Whites, Joseph winning the ball in the middle of the park and sending Williams through but he blasted over from the edge of the box. Seven minutes remained as Puddy kept his side in the game. Manny Williams picked out namesake Luke on the left, he helped the ball on to the ever willing Wishart who saw his powerful shot well tipped over by Puddy with the strange result being a goal-kick. 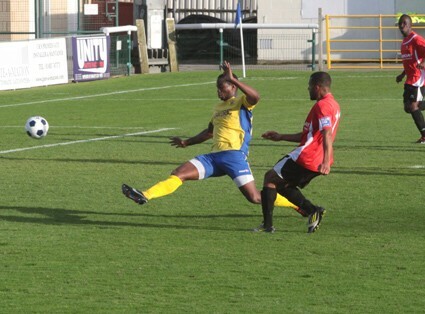 The visitors almost snatched it on the break as a left wing Lewis cross found McPhee at the far post, his first time effort going past Beasant's dive but a well positioned Spence was there to clear the ball away from inside his own six yard box. At the other end Wishart fired in a centre that a flying Manny Williams only just failed to connect with and then as the game entered stoppage time a fierce 30 yard drive from Matt Clark had Beasant flying across his goal but the ball went wide of the target. The killer moment came in the third minute of stoppage time as Joseph was pushed to the ground just outside the Whites area and a free-kick was awarded by Mr Cook. Luke Williams stepped up and curled the ball superbly over the wall and in off the underside of the crossbar and despite the visitors throwing all and sundry forwards for the remaining three minutes it was to no avail and United progressed.